The African Americans: Many Rivers to Cross is the companion book to the six-part, six hour documentary of the same name, airing on national, primetime public television in the fall of 2013. The series is the first to air since 1968 that chronicles the full sweep of 500 years of African American history, from the origins of slavery on the African continent and the arrival of the first black conquistador, Juan Garrido, in Florida in 1513, through five centuries of remarkable historic events right up to today—when Barack Obama is serving his second term as President, yet our country remains deeply divided by race and class.The book explores these topics in even more detail than possible in the television series, and examines many other fascinating matters as well, such as the ethnic origins—and the regional and cultural diversity—of the Africans whose enslavement led to the creation of the African American people. It delves into the multiplicity of cultural institutions, political strategies, and religious and social perspectives that African Americans have created in the half a millennium since their African ancestors first arrived on these shores. Like the television series, this book guides readers on an engaging journey through the Black Atlantic world—from Africa and Europe to the Caribbean, Latin America, and the United States—to shed new light on what it has meant, and means, to be an African American.By highlighting the complex internal debates and class differences within the Black Experience in this country, readers will learn that the African American community, which black abolitionist Martin R. Delany described as a "nation within a nation," has never been a truly uniform entity, and that its members have been debating their differences of opinion and belief from their very first days in this country. The road to freedom for black people in America has not been linear; rather, much like the course of a river, it has been full of loops and eddies, slowing and occasionally reversing current. Ultimately, this book emphasizes the idea that African American history encompasses multiple continents and venues, and must be viewed through a transnational perspective to be fully understood. Henry Louis Gates, Jr., is the Alphonse Fletcher University Professor and director of the W. E. B. Du Bois Institute for African and American Research at Harvard University. He is the author of 16 books, including Life Upon These Shores: Looking at African American History, 1513–2008 and Tradition and the Black Atlantic, and has made 12 documentaries, including Finding Your Roots, Black in Latin America, and Looking for Lincoln. He is also the editor-in-chief of The Root, a daily online magazine. He is the recipient of 51 honorary degrees and numerous awards. In 1981, he was a member of the first class awarded "genius grants" by the MacArthur Foundation, and in 1998, he became the first African American scholar to be awarded the National Humanities Medal. He was named to Time’s 25 Most Influential Americans list in 1997, to Ebony’s Power 150 list in 2009, and to Ebony’s Power 100 list in 2010 and 2012. The Henry Louis Gates, Jr. Reader, a collection of Professor Gates’s essays, was published in 2012. Donald Yacovone, the research manager at Harvard University’s W.E.B. Du Bois Institute, earned his Ph.D. from the Claremont Graduate School and has taught at Pitzer College, the University of Arizona, and Millersville University of Pennsylvania. He was an editor at the Black Abolitionist Papers project before becoming the senior associate editor at the Massachusetts Historical Society, where he founded and edited The Massachusetts Historical Review and organized many public history programs in the Boston area. An expert in Victorian manhood, the antislavery movement, and the 54th Massachusetts Regiment, he has published six books, including Samuel Joseph May and the Dilemmas of the Liberal Persuasion; A Voice of Thunder: The Civil War Letters of George E. Stephens; and most recently, Lincoln on Race and Slavery, with Henry Louis Gates, Jr.
"THE AFRICAN AMERICANS: MANY RIVERS TO CROSS is an eye-opener. Henry Louis Gates, Jr., and Donald Yacovone brilliantly recount the story of people of African descent in mainland North America across some five centuries with deep knowledge of the evolution of the African American experience and great sensitivity to its complexity. Few accounts better capture the changing texture of black life, as black men and women remade their society on new ground." 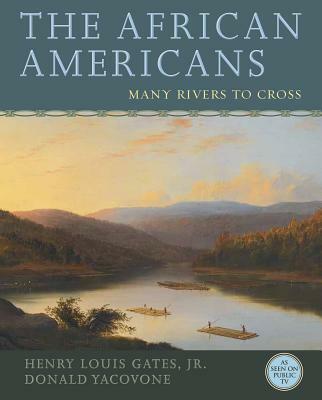 "THE AFRICAN AMERICANS: MANY RIVERS TO CROSS is an ambitious and original book and the companion to the documentary film that demonstrates how thoroughly North America, and what became the United States, has been shaped by four centuries of African American experience on these shores, in our fields and cities, and in our legislative halls. Gates and Yacovone provide a distinctive vision and voice that carries a huge and complex story. Our language, our migrations, our music, our art and poetry, the ways we walk and talk, our dreams and nightmares, our social movements, the great pivots and changes in our political and constitutional history, our very imaginations as Americans are forever products of the African American stories flowing through our bloodstreams and moving across our landscapes. We are all the products of the slavery and the freedom that this film series presents. This is everyone’s American and African American history, whether they know it or not." "Vibrant, immersive, and irresistible—abounding in rich scholarship and throbbing with the energy of a story waiting too long to be told—this priceless volume fills a gaping void in the literature: a comprehensive yet compact history of the African American experience. Told with urgency and authority by major scholars who also happen to be gifted craftsmen, here is popular history writing at its best. With no disrespect to its genesis via another of Gates’s essential television documentaries, this is no more a ‘companion’ volume than black history is a ‘companion’ to American history." "Everyone who cares about Black History needs this book in their library! The authors’ deep love of the African American experience has led to a detailed, nuanced, important, and fresh examination of our history."